The Adventure Cycling Association is a great organization that originated with the celebration in 1976 or the United States of America's 200th birthday celebration. Many people decided to celebrate and discover the USA by riding their bicycles from coast to coast. "Adventure Cycling Association inspires and empowers people to travel by bicycle. Established in 1973 as Bikecentennial, Adventure Cycling is the premier bicycle-travel organization in North America with 45,000 members. We are headquartered in Missoula, Montana." Adventure Cycling's programs include creating biking maps and routes, sponsoring guided tours, Adventure Cyclist magazine, helping create a U.S. Bike Route System, and maintaining their online site that includes how-to resources, an online store, and online communities. The website's resources include where to travel, including the organizations wonderful bike-specific travel maps with routes across the U.S., north to south and east to west. Most of the maps route the best way to travel by bike, such as the Northern Tier route and the Southern Tier route maps; however, some additionally have historical significance, such as the Lewis and Clark route and the Underground Railroad route. Their how-to articles are just that--concise, useful information from equipment to bike gears to what kind of bike to use. All this information is written, sorted, and sifted by experts whose full-time job is to get us on the road using human-powered vehicles. My wife and I are members and enjoy their regular mailings of Adventure Cyclist magazine. Much better than TV. The website also has many great photos illustrating the possibilities of travel by bicycle. 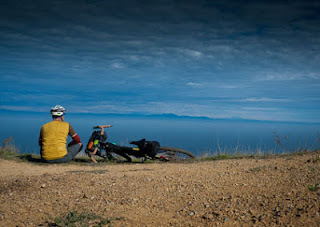 Be sure to check out their Photo of the Week, featuring many great photos of bicycle touring. There's nothing better than enjoying the great photos while waiting for winter to end--except being there!